grass stains: "MOMMY, PUT THIS ON YOUR BLOG." "MOMMY, PUT THIS ON YOUR BLOG." 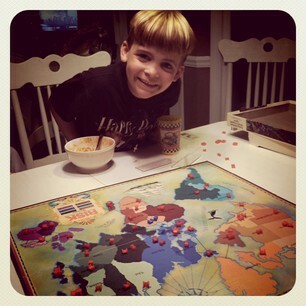 Last night, Nicholas triumphed over both Grayson and Nathaniel in a game of Risk. As he danced around the table, raising his arms in victory and crowing like a rooster at sunrise, he said, "I BEAT AN ALMOST 9-YEAR-OLD AND A 41-YEAR OLD! "MOMMY! Take a picture and put it on your blog! ALL THOSE PEOPLE NEED TO SEE THIS!" A special P.S. to Kim: I don't even take pictures every day, but I'm sure you've noticed that in most pictures I post, either Nathaniel or Nick is wearing his Harry Potter T-shirt. Thanks again so much for thinking of them! Cute! I love the stuff that makes them proud at this age. I have noticed that they often wear those shirts. It makes me so happy to know the boys love them! That's so cool. Do they play the long version of that game?